Drinking water directly from the tap is a fool’s errand. It’s harmful to your health (depending on the population density and contaminant makeup of your area’s water system), it tastes like garbage, and it kinda looks disgusting. Sure, you could grab yourself one of those water filtration pitchers, but that’s a good thirty bucks and you will end up dragging that plastic behemoth in and out of the refrigerator time and time again. Plus, I don’t know about you, but for me they take up valuable refrigerator space that could be utilized for snacks. Enter the Faucet Water Filter. These magical devices are usually screwed or attached directly to the mouth of your kitchen water faucet. They offer a convenient and simple way to reduce the chlorine content, odor, taste, and contaminants from your drinking water. Additionally, they assist in the purification of city water, as well as the removal of lead or asbestos that may be found in trace amounts in regular tap water. Furthermore, faucet-fastened water filters assist in providing a drinkable, more pure water consumption experience, whether by inclusion into tea or coffee, used in the cooking process, or drank in a nice cool glass with some ice. Faucet water filters are a solid upgrade choice from the water pitcher filters that have been mentioned. The most effective filters make use of multi-level filtration mazes, which serve to remove an incredible percent of contaminants found in drinking water. These systems remain the most efficient method to filter out these contaminants without losing the minerals that give water its earthy, subtle taste. All faucet water filter systems we review here come with a valve as well, which allows the user to conveniently switch back and forth between regular tap water and filtered super water. Most these filters are relatively simple to install and operate, provided you get a solid seal going between the filtration system and the edge of the faucet. For god’s sake, make sure you get a solid seal going between the filtration system and the edge of the faucet. Also, it’s important to get a solid seal going between the filtration system and the edge of the faucet. Why did we mention this three times? We have seen countless reviews and have experienced firsthand the horror of an improper seal. Think of an erupting geyser, just smaller and in your kitchen. All three of these are available via Amazon Prime for very similar price ranges. The only thing to compare are the feature sets. Without any further ado, let’s hop right in to our 3 best faucet water filters. If you have been on the hunt for a faucet water filter that is a breeze to use, offers far less leakage (see the comment on geysers above) than the average entry level filtration system, yet still comes at a reasonable price point, I have great news for you. Your search is over, now that you’ve found the Culligan FM-25. This product features an expertly-manufactured adapter and sleek chrome finish with fingerprint resistance. It works with all types of standard sink nozzles (and comes with multiple adapter rings to support this claim), but will NOT work with drop-down faucets. Imagine the mess you’d have on your hands with that one. The Culligan FM-25 comes with a simple and minimal, yet classy design. The faucet filter and cartridge can be installed easily, without the need for additional tools or advanced engineering skills. There is also a low-pressure water diverter tab, allowing you to switch back and forth between regular tap water and the advanced filtration system filtered water (let’s face it, your dog isn’t getting that sweet, sweet filtered water). What’s more, the FM-25 boasts an impressive flow rate of half a gallon per minute at a pressure of 60 pounds per square inch. The lifetime of a filter is around 200 gallons, but if you’re anything like myself and most of the water filter pitcher users, you can probably stretch the lifespan of your filter out at least twice that volume. The filter handles water impurities and contaminants ranging from atrazine to chlorine, sediment and lindane, as well as bad tastes and odors resulting from unwanted bacteria and other contaminants. Furthermore, the Culligan FM-25 Faucet Mount Filter can reduce the overall turbidity of the water, operating between 30 and 100 PSI of pressure dependent on the flow of water chosen, and at temperatures ranging from 40 to 100 degrees Fahrenheit (4-38 C). This incredible faucet water filter system has been tested and certified by NSF International against ANSI standards. With the Culligan FM-25 Faucet Mount Filter with Advanced Water Filtration, you are several steps closer to supplying your home with cleaner, fresher, purer drinking water. For a strong and healthy immune system, utilizing clean drinking water is a no brainer. Most of your body is squishy liquid, so the squishy liquid you put into your mouth will typically end up all over your insides at some point. Do you really want bits of lead and bacteria floating around in your blood stream that don’t have any place there? 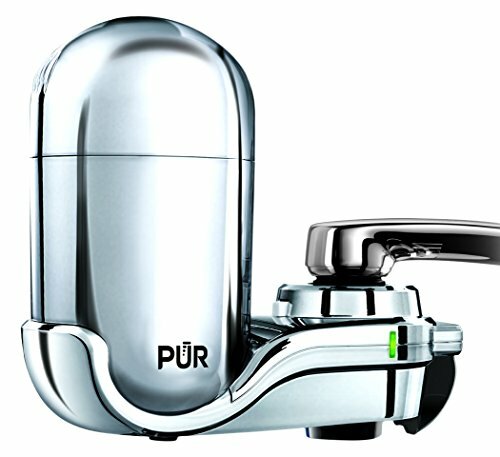 The PUR 3-Stage Advanced Faucet Water Filter is capable of conveniently removing more than 70 different type of water contaminants, conveniently turning your ordinary unfiltered, tap water into clean, fresh-tasting drinking water. Statistics reveal that this amazing faucet water filter system can remove approximately 99% of Lead, 96% of Mercury, 92% of pesticides, and various types of water impurities and contaminants. However, the natural, beneficial mineral content of the water will be left and filtered through. You can always expect a well filtered tap water result with a crisp, refreshing taste. What sets the PUR 3-Stage Advanced Faucet Water Filter apart from the other faucet water filter systems on our list is its filtration approach. Featuring unique MAXION technology, the PUR 3-Stage Filter flawlessly blends carbon and ion exchange materials, maximizing the contaminant reduction ability. It also comes with an in-built electronic filter life indicator (you can read that as a blinking red button). This will notify you when you need to remove and clean or replace the filter, ensuring that the system continues to function at optimal performance. You can remove or replace the system using the easy one-click installation. Or you can do like we do and ignore the blinking red light and continue using your filter for well past the recommended life cycle. We won’t tell anyone, we promise. The PUR 3-Stage Advanced Faucet Water Filter features a 360-degree swivel, working flawlessly in tandem with standard faucets. However, it cannot be used with hand-held or pull-out faucets. This is the case with pretty much all faucet water filters. Each PUR faucet filter is capable of absorbing and trapping the contaminants and mineral content of the tap water, providing over 100 gallons of clean, filtered water over the lifespan of its internal filter. Unique MAXION filtration technology, superior contaminant removal, 360-degree swivel for convenience, one-click installation, and high-quality construction and product development, make the PUR 3-Stage Advanced Faucet Water Filter System one of the easiest and most reliable ways to obtain fresher, cleaner, better tasting water. 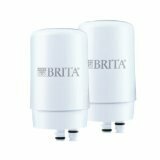 The third and final faucet water filter system we will be delving deeper into is the Brita Chrome On Tap Faucet Water Filter System. 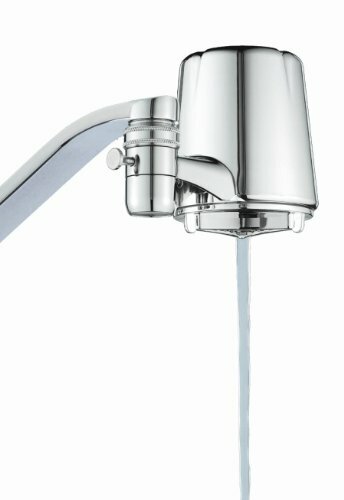 This unique chrome (you guessed it) system fits firmly and flawlessly onto almost all standard faucet openings, leaving no room for leaks and geysers of water all over your kitchen. However, repeat after me as this is not the first time we are hearing this: it cannot be used with spray style, drop down or pull-out faucets. The system is easy to install and use, with no advanced technical knowledge needed and no need for power tools, chainsaws, or even wrenches. Furthermore, the Brita On Tap Chrome Water Faucet Filtration System greatly assists in reducing strong chlorine tastes prevalent in most city-specific tap water. The Brita system can also remove bad odors, asbestos contaminants, benzene, trichloroethylene, and lead, all of which are large dangerous words usually found in common tap waters. The multiple additional filtration layers of the Brita option can remove even the smallest particles of cryptosporidium and giardia cysts found in domestic tap water. In addition, the basic faucet water filter system has the capability to supply approximately 150 gallons of well filtered tap water. We are working in repetition of threes with these reviews though, so let’s hear it one more time: You can definitely (and should definitely) stretch the life of these extra filters out some. I’d say 300 gallons would still be perfectly safe. 500 gallons might be stretching it. 1,000 gallons and you’re wasting your time. To ensure that the Brita On Tap Chrome Water Faucet Filtration System serves you optimally, it comes with a blinking green and red indicator. This notifies you when the filter is working and when it should optimally be replaced. The unique design and chrome finish makes it flawless for matching your contemporary kitchen decor. With the Brita On Tap Chrome Water Faucet Filtration System, you can get better tasting, cleaner, purer water for various domestic uses, while simultaneously saving money on plastic water bottles, and saving space in your fridge.